Tomorrow Luke & I will be participating in the Color Run. I'm so excited! 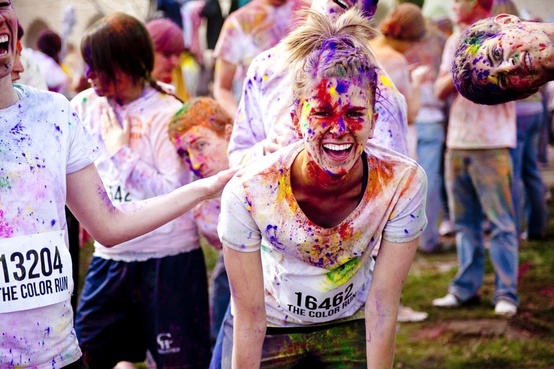 :D I've been wanting to do a color run for a long time & here's my chance! But first, we're going to attend a pre-race dinner tonight and meet the designers of the Chevy Spark (their first mini car in the U.S.)! What does that have to do with the race you ask?? This year Chevy is partnering with the Color Run and the Spark will be the official vehicle and pace car of the race through 2013. Kind of a fun little event to get everyone excited about the run tomorrow! Have you even done a Color Run? Looks like a lot of fun! I enjoyed getting to see your parents over the weekend! I miss having them close by and seeing them often! yes! and it was such a blast, you and luke will love it i'm sure. i took my point and shoot in a plastic baggy to take pictures throughout the race. for me, it was totally worth it. also to capture the "color cloud" at the very end. All of the color runs near me were sold out this year when I found out about them. I definitely doing one in 2013 though!!! So fun. Yeee! Have fun!!! I know a few people who are doing it tomorrow, hope it all goes well for everyone!! !